The ascension of Jesus Christ to heaven capped his earthly life. 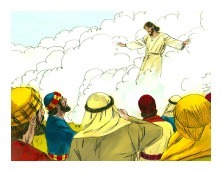 Witnesses watched in utter amazement as the King of kings and Lord of lords rose out of sight to heaven's glory. 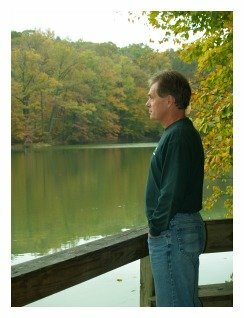 Please read Luke 24:35-53 before starting GraspingGod.com's free Bible study lessons, #1.23. 1) How many people watched Jesus Christ's ascension? 2) What did Jesus' ascension lead the people to immediately do? 3) What was so important about the 40 days prior to the ascension of Jesus Christ? Over 500 people watched this remarkable event - the ascension of Jesus to his Father's right hand of power. Oh, I wish I could have seen it happen! How about you? Fortunately, by faith, God allows you and me to see it through the eyes of the witnesses. Let's learn more about Jesus' ascension to heaven. Jesus Christ not only rose from the dead, but he rose all the way to his Father's house in heaven. Jesus was giving final instructions on the Mount of Olives to his followers when he rose on a cloud to heaven. Two angels instructed the amazed crowd that Jesus had been taken away to heaven! 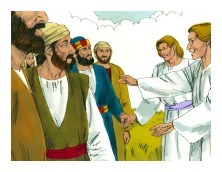 They added that he would return to earth in like manner someday (Acts 1:9-11). The ascension of Jesus led the throng of followers to break into worship - glorifying their risen Lord! Since that glorious day, the risen Christ sits on his throne reigning supreme over creation. Let's back up a moment to something very important. Forty days had passed from the time of the crucifixion to the ascension of Jesus. At various times the risen Christ appeared to his disciples. He talked with them, ate and drank with them, and taught them about their upcoming assignments. The elapsed 40 day period was very important for several reasons. First, the disciples were having an extremely difficult time believing that Jesus was truly alive. The ethereal nature of the glorified Christ left them struggling with reality, quite possibly wondering if they were dreaming. The 40 day period between the resurrection and the ascension of Jesus gave them time to pinch themselves, fully absorbing the truth of Jesus' resurrection. It was imperative that the disciples completely believe in the resurrection. 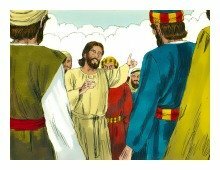 Jesus chided the disciples in Luke 24:25, "O foolish ones, and slow of heart to believe in all that the prophets have spoken!" 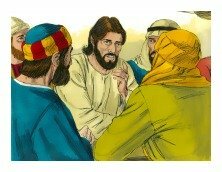 Jesus scolded these men for their lack of faith in the Scriptures and in him. Can you imagine how hard the devil was working on the disciples in order that they doubt, and eventually forget the fact of Jesus' resurrection? Put yourself in their shoes. Wow! Acts 1:3 states, "He also presented himself alive after his suffering by many infallible proofs, being seen by them during forty days and speaking of the things pertaining to the kingdom of God." The resurrection is the centerpiece of Christianity, and Jesus knew the disciples had to believe, and maintain belief in his resurrection. The future of Christianity relied upon the strong testimony of the apostles in Jesus' resurrection. 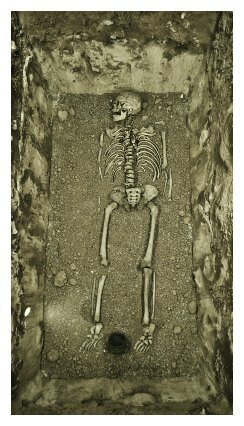 Doubt in the resurrection would have resulted in a disaster. Second, Jesus instructed the disciples in Acts 1:3-8, for the final time, about the nature of the kingdom of God. He told them details of their mission and also the source of power to fulfill the mission. They had to remember that the power was divine. This teaching was designed to prevent future pride on the disciples' behalf. The weeks before the ascension of Jesus were extremely productive for the future Kingdom. Third, and advancing the thought of #2 further, Jesus took the necessary time to instill in the disciples' hearts the gravity of the mission to evangelize the entire earth. The design of the mission wasn't simply for a certain nation or even a part of the earth; the goal of the assignment was to ultimately reach all ends of the earth with the good news of Christ. The commission was a massive assignment for these young men to grasp. But, they weren't the ultimate finishers of the assignment - future Christians would take that role. However, the disciples had to establish the mission and build a foundation for the future. They also had to become the role models to show future disciples proper methods of Christian life and evangelism. Finally, the forty days culminated in two angels announcing the ascension of Jesus, leaving the eyewitnesses with something extremely important: Jesus Christ would return to earth in the same way he departed. This brought an official announced end to Christ's initial work on earth, opened the door for the Holy Spirit to build the church, and builds an anticipation for the second coming of Jesus Christ. We are all to be constantly on guard for his return. Jesus' departure left no expectation that he would continue to visit them. Jesus was physically gone from earth, and will be until his 2nd coming. Forty days passed before the ascension of Jesus and hundreds of witnesses saw him. Many had personal encounters with him. He instructed them and gave his final words during the ascension event. What an exciting time for all of his followers, and for us, too! Believing in God by faith means that we see Jesus through the eyes of those who witnessed him. Sure, we have to imagine what Jesus and his angels looked like, and the details of what happened around the event, but we'll be rewarded by God for believing in him, without actually seeing him (John 20:29). That's a terrific promise from Christ. Wow! Jesus Christ ascended to heaven in his resurrected, glorified body. Get this, here's the best part: First Corinthians 15:23 says that "Christ was raised as the first of the harvest; then all who belong to Christ will be raised when he comes back." He is our model - the very first of the resurrected ones, including you and me! Isn't it wonderful to know that you won't remain in a grave, and that your spirit will live forever? Doesn't the thought of your future corpse being dropped underground in a box bother you? It used to bother me, that is, until I met Jesus. For the real Christian, there is no fear of death, because death was defeated by Christ on the cross (1 Corinthians 15:54-57). We'll receive new glorified bodies much like Jesus received at his resurrection. He is the first fruit of a great harvest. What an awesome day our resurrection will be! I get so excited learning about these great promises from God! Jesus says to all believers in John 14:19; 14:1-2, "Soon the world will no longer see me, but you will see me. Since I live, you will also live. Don't let your hearts be troubled. Trust in God, and trust also in me. There is more than enough room in my Father's home. If this were not so, would I have told you that I am going to prepare a place for you?" This means that you and I will be in resurrected, glorified bodies just like our Savior! Not only that, but, we'll get to live in a place that is unimaginably beautiful. Not only that, but, we'll get to live with Jesus and all his awesome angels and resurrected saints! Not only that, but, we'll get to rule over the entire universe with Jesus! (Revelation 20:6). Trusting Jesus means SO much, almost too much for our minds to grasp. My heart just warms and melts within me, pondering the magnificence that awaits those precious people who trust Jesus Christ. Because of the future great privilege we'll inherit in heaven, Paul warns , "Think carefully about what is right, and stop sinning. For to your shame I say that some of you don't know God at all" (1 Corinthians 15:34). We really need to clean our acts up by stopping our foolish sinning. Jesus is doing this incredible work for us and we treat him horribly. As disciples of Jesus we have the highest responsibility to love him and his word. The way in which we live our lives proves to God, ourselves, and other people whether or not we truly love God. This lifetime is a proving ground for our personal faith - let's responsibly follow Jesus. Let's continue to grow together and grow closer to God. Those who follow Jesus must abandon trusting in things unrelated to God, pledging devotion to Jesus Christ - ALONE. Our thoughts and hearts should ascend to heaven with Christ himself, because, if we're a true believer our bodies will soon follow his lead. The ascension of Jesus should make us stand and praise our Lord. It gives us great hope, a sure hope, for sharing the future glory with Jesus Christ. 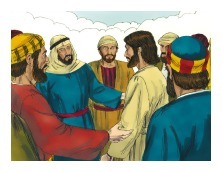 1) Can you recall some of Jesus' meetings with people prior to his ascension? 2) Contemplate what could have happened to Christianity had Jesus not taken 40 days to reveal himself to his followers. 3) What responsibilities do we have as followers of Jesus Christ, and future heirs of his Kingdom? What I am saying, dear brothers and sisters, is that our physical bodies cannot inherit the Kingdom of God. These dying bodies cannot inherit what will last forever. But let me reveal to you a wonderful secret. We will not all die, but we will all be transformed! It will happen in a moment, in the blink of an eye, when the last trumpet is blown. For when the trumpet sounds, those who have died will be raised to live forever. And we who are living will also be transformed. For our dying bodies must be transformed into bodies that will never die; our mortal bodies must be transformed into immortal bodies. After sharing this page on Facebook or Twitter below download your FREE printable Bible Study Lessons: Ascension Of Jesus, Lesson 1.23. Special Note: I'm grateful to Big Book Media & Free Bible Images, Stock Exchange, Morgue Files, and Stock Photos For Free for the use of their photos for Ascension of Jesus Bible study lesson.